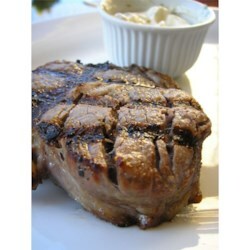 "Tenderloin (sometimes called filet mignon) is the king of steaks. It's lean, tender, you can add any desired flavor to it and it will absorb it all, and you can cut it with a butter knife. This is expensive, though, so only cook this once in a while." I like to serve this with mashed cinnamon sweet potatoes, dill grilled green beans, and a side salad. This was actually a pretty good recipe, of course it always depends on the cut of meat you buy, and be sure to bring it up to room temperature before grilling or broiling.